Sickle cell disease is an inherited blood disorder affecting mainly people of African descent. This blood disorder affects the hemoglobin in the red blood cell. Hemoglobin is the protein that carries oxygen throughout the bloodstream. People with sickle cell disease have inherited a gene from both their mother and father that causes abnormal hemoglobin to be produced. The disease is named after the sickle shape of the red blood cells produced in people with this condition. Normal red blood cells are circular, and they can easily travel through the tiny vessels of the bloodstream to carry oxygen to all parts of the body. The red blood cells that carry abnormal hemoglobin often stick together, break easily, and eventually form in the shape of a sickle, with a curved sharp end. Sickle cells clog blood vessels, and because they are more fragile than normal red blood cells, they break down faster, causing anemia. Although sickle cell disease has no cure, people with this condition live well into their 50s with modern treatment, which includes antibiotics and vaccinations to prevent childhood diseases. Sickle cell crisis, a serious complication involving uncontrolled pain, or lung and heart problems, usually requires hospitalization. Serious complications of sickle cell disease can be prevented by having regular check-ups, eating a well-balanced diet, and avoiding overexertion, stress, and extreme temperatures. If the patient develops a fever or other signs of an infection, prompt treatment is needed. Sickle cell disease is an inherited condition present at birth, but the condition is not apparent until a child is 4 to 6 months old. It is primarily seen in people of African descent, although Arabs, Greeks, Latinos, Italians, and people from India can also inherit sickle cell disease. The diagnosis is made by using a special blood test known as hemoglobin electrophoresis to determine if abnormal hemoglobin is present in red blood cells. A child must inherit two sickle cell genes�one from each parent�to develop sickle cell disease. If a child has inherited the sickle cell gene from only one parent, he or she will carry the sickle cell trait. People with sickle cell trait do not usually have symptoms of sickle cell disease, but they can pass the sickle cell gene on to their children. It is critical that prospective parents be tested for this gene so they will know if their children will be at risk for developing the disease. 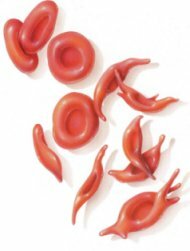 Oxygen Cannot Reach Organs: Sickle cell genes result in the production of an abnormal form of hemoglobin, which causes red blood cells to stick together and form the shape of a sickle, with a curved sharp end. Sickle cells clog blood vessels, and because they are more fragile than normal red blood cells, they break down faster. Both of these situations lead to the symptoms of sickle cell disease. When the red blood cells break down too quickly, the amount of hemoglobin in the blood falls below normal, causing anemia and fatigue. When blood vessels are clogged, oxygen cannot reach the body’s organs and tissues where it is needed. The result is a series of painful crises, usually in the bones of the arms, legs, chest, and back. Almost all patients with sickle cell disease experience periodic bouts of pain, which can last for hours to days, and they are often in need of strong pain medications. Bedrest can help by reducing the need for oxygen. In some cases hospitalization and administration of intravenous fluids are required. In severe cases, the spleen becomes damaged by the massive numbers of sickled red blood cells and it must be surgically removed. Other common complications include stroke; destruction of joints; leg ulcers; infection; kidney, liver or lung disease; and miscarriage. Treatment: The treatment for sickle cell disease is to control the symptoms and avoid crises. Patients with sickle cell disease must drink 8 to 10 glasses of fluid daily to prevent dehydration and a potentially painful crisis. Oxygen therapy is often used in the disease, especially during an illness. Patients with sickle cell disease may take a folic acid supplement to replace a deficiency if one exists. It is also important for children under age 6 to take a daily antibiotic to prevent the most dangerous complications in this age group�pneumonia, meningitis or blood infections. These infections are the most common cause of death in children with sickle cell disease. Children should receive all the recommended childhood vaccinations and pneumococcal vaccine; some physicians recommend yearly flu vaccines as well. Currently, there are no drugs that can stop red blood cells with this abnormal hemoglobin from sickling. Drugs that will help prevent dehydration, improve the shape of the sickled cells so they do not break as easily, or keep blood vessels open so they do not become blocked are all being studied in patients with sickle cell disease.